Looking for unique handmade presents for Mother’s Day? Try these colorful and eclectic DIY Mother’s Day gift ideas to make her smile! With Mother’s Day just around the corner, I wanted to share handmade gift ideas from some of my favorite eclectic bloggers that are colorful and fun. I hope these non traditional DIY gift ideas will spark some creative inspiration for you like they did for me! Each post includes an easy to understand tutorial so make sure to click through to read the original post and save images to Pinterest. Pin unique gift ideas for mother’s day image for later! Customize this DIY Pasta Patterned Planter from A Kalio Chic Life with your mom’s favorite color for a bright and interesting home decor piece. Let your mom have fun with fashion by gifting these cute DIY Shoe Appliques from The House That Lars Built. Try your own DIY flower arrangement for mother’s day instead of store bought flowers with Everyday Flowers Roses and Thistle from Julie Blanner. Give your mom her favorite bottle of wine and these adorable DIY Pineapple Inspired Wine Charms from Casa Watkins Living. 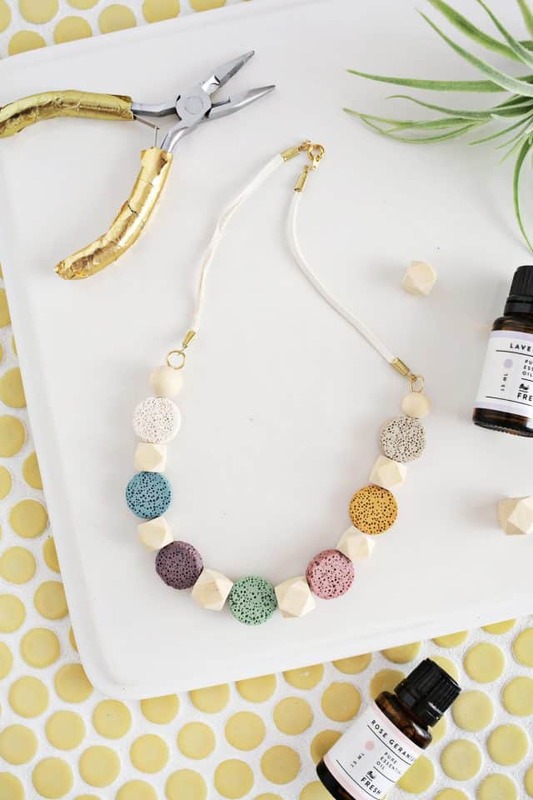 Make a Lava stone necklace DIY (for essential Oils) from A Beautiful Mess and pair with a favorite oil for your mom to try. This DIY Dollar Store Mason Jar Mug in a Mitt Gift from This is Our bliss was meant as a hostess gift but it’s perfect for mother’s day too. Add your mom’s favorite flowers or foliage stems to a Dollar Store Confetti Vase from Up to Date Interiors. Make a Mini Coiled Clay Bowl from Delineate Your Dwelling as a pretty storage container for jewelry, office supplies, change, or bathroom toiletries. Try your own hand at candle making with gorgeous DIY Wood Wick Candles from Swoon Worthy. These DIY Holly Golithgy Sleep Masks from PMQ for Two are so cute and would be great to pair with the classic movie as a gift idea. If your mom loves home decor, try updating a plain pillow with this DIY No Sew Stamped Pillow tutorial from Designing Vibes. This might be a seasonal DIY but how lovely would it be as a mother’s day gift? See the full Spring Basket Wreath DIY at Homemade by Carmona. If you want to create DIY art, you’ll love Persia Lou‘s How to Paint Watercolor Agate Slices with step by step instructions. DIY Marbled Candle Holders from Birds Party are great for taper candles and easy to customize with your mom’s favorite colors. Update a planter with Washi Tape and your mom’s favorite plant from Up to Date Interiors. I can’t wait to try some of these! Aren’t they fantastic? Do you have a favorite DIY mother’s day gift idea? If the spring cleaning and decorating bug has bit you, make sure to sign up for a free 5 day email course and check out 10 easy ways to simplify your decor. Great ideas Kathy! Thanks for including my pineapple glass charms. Such a wonderful surprise. 🙂 Side note, I truly thought the marbled candle holders were donuts for a moment. Clearly you can see where my mind is at right now. 🙂 LOL.